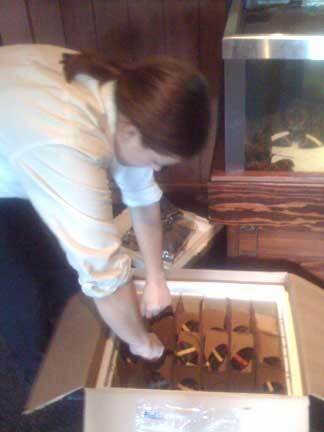 A Red Lobster employee unpacks a box of live lobsters at Red Lobster in Gainesville. She places the lobsters in the lobster tank and then watches to see that they start moving. Only one from this box didn't successfully survive being shipped. That’s one of my messages for tomorrow’s lecture when we talk about an upcoming assignment that requires the students to find their own story ideas. For this assignment, we are asking the students to select a story that has an environmental, health, science or technology angle. And those stories abound in a state like Florida and on a campus like the University of Florida. 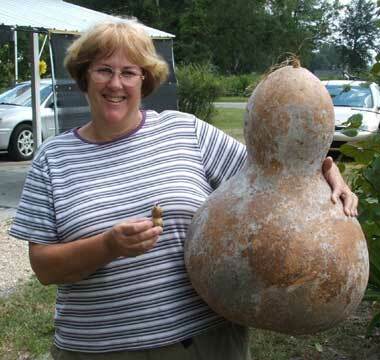 Barbara Young, owner of Fernsink Gourds, near Trenton, Fla., shows one of her largest and one of her smallest gourds. I often find myself thinking, “This would be a great story” as I see something interesting happening. I thought that at Red Lobster when I was there when the boxes of lobsters arrived. I hadn’t thought about how lobsters arrived. But they are shipped alive standing on end and packed somewhat like eggs in a carton. This led me to thinking about a box going astray and the poor lobsters that would die in transit — versus dying in the Red Lobster kitchen. What about other shipping techniques for food that must be shipped alive or at a certain temperature? And then there was the trip to a Fernsink Gourds, a farm near Trenton, about 45 minutes west of Gainesville. I had no idea that so many different kinds of gourds exist and that so many people are interested in buying them. The small gourd she is holding is from a gourd species native to South America and is used for making jewelry. The large gourd is native to Africa and is used as a large storage container, especially for water. The owner of this gourd farm receivesorders for her gourds as well as having people drop by her farm to purchase gourds. One of the groups interested in gourds are Civic War reenactment groups that use the gourds as canteens and gun powder holders. What a great story. Tom Czubek, a graduate student working with the Whooping Crane Eastern Partners, checks to see if he can find Whooping Cranes at Paynes Prairie. Each of the cranes he is tracking has a unique radio signal that is transmitted from a leg band it wears. When I was hiking on the La Chua trail, I ran into another possible story. This researcher, who works for the Whooping Cranes Eastern Partners, was trying to locate one of several Whooping cranes that were feeding with the Sandhill cranes that were at Paynes Prairie, which is just on the edge of town. 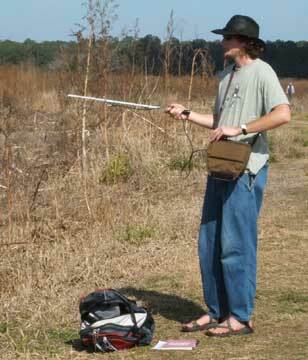 In his notebook, he had a numbered list of tagged Whooping cranes and was hoping to be able to follow their migration. Every year, hundreds of Sandhill cranes spend part of the winter in the Gainesville area. Sometimes you can hear them overhead — high up in the clouds. At Paynes Prairie, you can see (but sometimes it requires binoculars) a flock of them looking for food, either in the field grass or in shallow water. I had my camera, notebook and even an audio recorder with me. So I was able to interview the reseacher. Being a reporter gives you the opportunity to ask questions and find out about lots of interesting topics and meet many interesting people. That’s part of the fun of working in the media. But you have to start developing that nose for news and a willingness to talk with people you don’t know.